William Reese. The Origins of the American High School. Yale University Press, 1995. This engrossing book tells the story of American high schools in the nineteenth century. 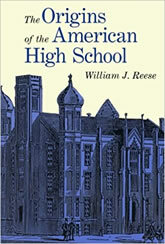 William Reese analyzes the social changes and political debates that shaped these institutions across the nation—from the first public high school, established in Massachusetts in 1821, to the 1880s, by which time a majority of secondary students in the North were enrolled in high schools. Reese also explores in generous detail the experience of going to school. Drawing on the writings of local educators and school administrators as well as on student newspapers, diaries, and memoirs, he brings to life the high schools of a century ago, revealing what students studied and how they behaved, what teachers expected of them and how they taught, and how boys and girls, whites and blacks, and children in different parts of the nation perceived their schools. America’s earliest public high schools were built in major cities along the eastern seaboard, and they became an important factor in the building of free public school systems, bringing a broad range of middle-class citizens into their orbit. Reese shows that although high schools were condemned by critics as elite institutions of classical learning, they were in fact largely dedicated to offering talented, mostly middle-class youth a quality education in modern, practical subjects.